Mumbai, January 27, (Scoop News)-The grand and spectacular 33rd annual day festival celebration of Film Studios Setting and Allied Mazdoor Union was held on the Republic Day, 26th January 2017 at Chitrakoot Grounds, Andheri (West),Mumbai. The extravagant festival was successfully organized by the dashing BJP MLA and Chairman Ram Kadam of one of the biggest labour union of the entertainment industry in Asia with General Secretary Gangeshwarlal Shrivastav A.K.A Sanju and other office bearers and staff.The programme began with the announcement of free medical camp for all its union members which was followed by musical bout. After the musical orchestra session, all the dignitaries and honorable guests present lit the traditional lamp. Thereafter the National Anthem was rendered by one and all present at the venue showing solidarity.Then a moment of silence was maintained in a tribute, respect and condolences to all those members who have left for heavenly abode. 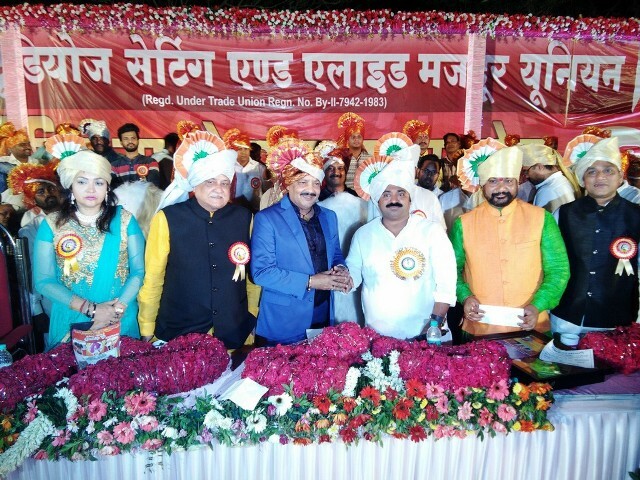 The Union’s General Secretary Gangeshwarlal Shrivastav A.K.A Sanju welcoming all the respected guests, honoured them by presenting bouquets, shawl and memento which included Legendary Singer Udit Narayan,Veteran actor Raza Murad, IMPPA’s President & Program President T.P. Aggarwal, Raju Shrivastava, President of FWIC B.N.Tiwari,Film & Television Institute of India’s President Gajendra Chauhan, President of Utter Bhartiya Mahasangh Yogesh Dubey, Vasai Virar Municipal Corporation (VVMC) Mayor Ms. Pravina Thai Thakur,R. N. Sinha,Chandrakant Malkar,Cinta’s General Secretary Sushant Singh,Tina Ghai,Sahila Chaddha,Ashok Dubey and many others. The meticulous efforts of Film Studios Setting & Allied Mazdoor Union’s dashing MLA - Chairman Shri. Ram Kadam, General Secretary Mr. Gangeshwarlal Shrivastav, Senior Vice Chairman Sharfuddin Mohammed, Vice Chairman Jagdish Patel, Joint Secretaries Rajmangal Yadav and Rakesh Maurya, Treasurer Bhagwati Prasad Shukla, Advisor Dinesh Chaturvedi (Dadu), Rajesh Anbhavne and other distinctive office bearers have made the 33rd anniversary function a grand fare. The function was successfully concluded in presence of Navin Dubey, Surendra Mishra, Pradeep Singh, Adv. C.P.Singh, Prakash lagad, Amit Bahel, Nagrsevak vasai virar’s sabhapati Rupesh Jadhav, Sabhapati Pankaj Patil, Nagrsevak Sitaram Gupta, Prakash Chaudhari,Aanjali Patil, Nagrsevak Samjsevak Ramji Mishra, BN Tiwari’s wife, president.Prakash Upadhyay, Radheshyam Tiwari, J.P. Singh, Deepak Chaudhari,Ramesh Mishra, Jagdish Amin, majhi nagrsevak Andheri Pramod Dubey,Raj Sudhakar Mishra,Shahrukh khan (Raj akadami’s president),Shivkumar Tiwari etc expressed their views and extended their warm wishes to all those present. General Secretary Gangeshwarlal Shrivastav thanked them all for their herculean efforts.